Answering questions about a student’s horsemanship is more difficult than you may think (if I want to do it well, which I do!). How you phrase your question can make the difference between getting an excellent/appropriate answer, an answer that didn’t quite answer what you thought you asked, or not getting an answer at all! I often get emails from students asking questions about their horsemanship, and I love to ‘remote problem solve’. It’s not so easy, though... Often I have never seen the student or horse they are asking about. All I have are words in an email to try to form a picture of the situation they are describing. Yet how I need to answer the question depends greatly on the context and the skill level of that particular horse/human. The hardest part in any question is to figure out what information this particular person actually needs at this moment in their journey. I found that some e-mails had questions that were easy to discern while other e-mails made it difficult to even figure out what the question was. Sometimes the question got hidden among a bunch of other information and I missed it. I decided to look at those emails and figure out why some questions were ‘easier’ to answer even if the actual question involved a lot of thought, and why some questions were more ‘difficult’ to answer even if the question was basic. I’ve developed a format that can help you organize your questions so they will elicit an answer with the best information for you. First, realize that asking a question is different than telling a story. In a story, there is a set up, then a slow build to a final, often dramatic conclusion. You have to hang on to the end to get the whole picture. This is NOT what you want to do when asking a question! Think more of how a newspaper works... There is a headline to grab the attention and bring focus to the subject, then the first paragraph says the most important things you need to get the picture... The rest of the article gives the extra details. This is called ‘The Inverted Pyramid’... You put the most important information at the top and the details get 'less important' as you go on... But do include them, because they are still important! This format I describe below assumes you are asking a question specific to you and your horse. If you are asking a general technique or philosophy question I would tempt you to make sure you have done your research first! In other words, if you ask a question such as: “What does collection mean?” or “How do you start a horse?” please understand that those are big questions! It is a general question so the answer, if answered fully, will need to cover a lot of territory.... There are entire books on those general subjects. And if I don’t answer it fully, (“collection = carrying weight on the hind end”, or: “start a horse from the beginning”)... Sometimes a little information is worse than none! If the person you are asking has written a book, has DVDs or articles, search them first! Find out what you can find out on your own. Curiosity, or ‘investigative behavior’ is a great thing to practice! If you have done your research and you STILL have a question, then you will be able to ask a more precise question in regards to your particular situation that will have a better chance of resulting in a meaningful answer. State the question first! Can you do it in one sentence? Example: What can I do when my horse hides from the contact and curls his neck when I ride him? Now, as I read everything else in your email, I will already know what it is connected to, and I will be looking for clues as to how best to answer YOU. I just passed my Level 3 in Parelli and I have never ridden a horse in connection with the reins before. This horse was trained in western pleasure until I bought him 3 months ago. This will help me know who I am talking to, and know what sort of information or exercises you will most likely be able to apply. Then give specifics about the issue in your question. Can you do it in bullet points? He does it in the halter and the bit, but worse in the bit. It happens every time, it doesn't seem to matter if he is having an introverted or extroverted day, but it is worse when he is introverted. This will help me find the important points and will be easy to reference back to. Just the process of doing this will help you understand the issue better! I can get him to stretch online... He does pretty well, but even then, sometimes his nose wants to go behind the vertical. Our freestyle is great... His impulsion is good, although tends to be on the ,whoa, side of things. I trust him and feel very safe on him. Here you can list things that pop in your head that you think may be important. 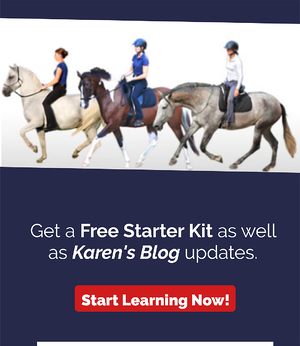 This other information helps the reader form a clearer ‘big picture’ of you and your horse. Now tell me what you have already tried: still bullet points! I have played with these different bits: _______, _________, and _______. He seems best in the ______ bit. I read your book and have played with the information in that and DVD #1 about riding in connection with the reins. I have been alternating from freestyle to in connection but he still just always thinks he is supposed to curl up. I have been doing Pilates to become more stable in my seat... Sometimes I feel wobbly and thought maybe that was making my hands unsteady. It is important to know what you have tried, and how it worked. Sometimes when you write it out, you may find that there is something obviously missing that you didn’t realize! Anything else I need to know? OK, now you can write a narrative! This is really frustrating. I feel like I need to be light with my hands. my other teacher (a lower level dressage trainer) says I need to make him take the contact and really drive him from behind. I understand he needs to be engaged, but it feels wrong... My horse seems to get worse even when the teacher rides him this way and then he refuses to go forward at all. I am 60 years old and have fox hunted all my life, but never rode dressage. I bought this horse because he is so smooth, sweet and calm and I thought I could play a little with dressage with him since I don’t care to go bombing through the fields anymore! It has to be easier than this! Please don’t let this article make you nervous/self-conscious about emailing me or another teacher your questions... This is written in the spirit of refining the art of clear communication... Which of course is a huge part of the art of horsemanship! I also believe that while going through the process of forming your question, you may better understand your question, and therefore be closer to finding the answer yourself! I love your material, thanks so much for the Classroom, it is amazing... I have learned so much. I started riding when I was 5 and I even competed in barrel racing, then did some English hunter jumper type stuff. I had a wonderful teacher, she really let us have fun during the lessons. I was so lucky. Then I went to college and stopped riding for a while. I started up again after I got married and I bought a warmblood thoroughbred cross. He is black and has 4 white socks... Really beautiful. He is the horse of my dreams. He runs off sometimes, but I am not scared of that, he just feels good and needs to move. I did start taking some lessons with a local trainer after doing Parelli foundation. She wants me to hold him tightly in the reins and sometimes he gets tense, but I have played with your material so I know how to make it better when I get home. He has a nice smooth trot, and I even started some jumping with him. I know I have scoliosis and I am doing pilates and yoga so I am becoming much more aware and symmetrical. I am using a myler comfort snaffle with your reins attached. I love them, and he seems to also. My question is could his head tilt when he goes track left be related to why I have trouble picking up the right lead? At home he is able to stretch nicely and he generally does his other transitions really well. Again, thanks so much for all you do! ....so how many of you were able to keep track of all those pieces of information in the beginning? If you were focused on the beginning, did you catch the question? And if you did, didn't you find you had to go back and re-read? Can you see that it is difficult to really give a personal, meaningful answer? The one question in there is actually a general question: “...could the head tilt when he goes track left be related to why I have trouble picking up the right lead?” My answer would be: “Yes, it could be related.” But that doesn’t help too much! I can deduce that he impulsive and unbalanced based on other things mentioned, but can you see it is not so easy to feel like I can give a great answer. Let’s see if I am even able to put it in the format above. Could the head tilt when he goes track left be related to why I have trouble picking up the right lead? What has she already tried? I started riding when I was 5 and I even competed in barrel racing, then did some English hunter jumper type stuff. I had a wonderful teacher, she really let us have fun during the lessons. I was so lucky. Then I went to college and stopped riding for a while. I started up again after I got married and I bought a warmblood thoroughbred cross. He is black and has 4 white socks... Really beautiful. He is the horse of my dreams. He runs off sometimes, but I am not scared of that, he just feels good and needs to move. I did start taking some lessons with a local trainer after doing Parelli foundation. I have played with your material so I know how to make it better when I get home. He has a nice smooth trot, and I even started some jumping with him. When organized this way it is clearer, but it is also clearer that a lot of information is missing! The best answer is the answer that is most appropriate for you! Anyone can read a book and repeat the technical information. The art of teaching requires that you know when to deliver which pieces of information! I LOVE to hear from my students and I LOVE to help problem solve remotely... So please help me, or any of your teachers, to be able to help you! I also think you will find that by organizing your thoughts you will be on your way to your own problem solving!